Registration is open for the 25th annual “Get to the Point” 5K Run at St. Stanislaus Kostka Catholic Academy, Greenpoint. Presented by Broadway Stages, the race takes place Sunday, Oct. 14, with children’s dashes beginning at 10:30 a.m. and the 5K race beginning at 1 p.m. 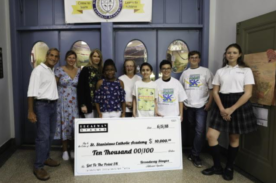 Proceeds from the race benefit the children and programs of St. Stan’s Academy, which has over 200 students from pre-K3 through eighth grade.